Home > Social Networks > Facebook > Is Having a Facebook Business Page Worth It? A cursory Google search for ‘Facebook reach decline’ is enough to illustrate the extent of the dilemma facing social media managers all around the world, those who rely on the platform as a key traffic driver for their clients. Among the search results you will find a wealth of blogs outlining tips, tricks and strategies to get around this rapid fall – which some studies put at around 50% – but is it even worth putting the time in to maintain your Facebook Page if you’re a smaller business without a large following or budget? Indeed, some companies, such as Bristol-based music blog Drunken Werewolf, have already decided to focus their time and resources on Twitter and Instagram rather than updating a platform where their posts will typically reach less than 10% of their audience. It certainly wouldn’t surprise me to see more smaller companies abandoning Facebook just like these guys. Let’s take an example. Your business or client has a following of 10,000 on Facebook. If you reach 10% of them with a single post, which is optimistic by some counts, your post will be seen by 1,000 people. If another 1% of them engage with the post, you’re looking at just 10 engagements on a piece of content that might have taken you hours to put together. They’re not the kind of numbers that are going to gain you extra fans, grow your reach or drive more traffic to your business in a hurry. Although there is a wealth of literature online advising you on how to ‘get around’ the Facebook algorithm, I’m becoming more and more of the opinion that for many companies, it simply isn’t worth the time. I would typically advise clients to concentrate their social media spend on paid rather than organic as nowadays it is a far more effective use of their money. I know it isn’t possible for everyone, but being able to persuade your client to plough their money into ad spend rather than Page management will reap additional benefits in the long-run. Facebook’s old reputation as a free source of traffic no longer stands up to scrutiny. Could Your Page Become a Group? In the wake of some News Feed changes announced by Facebook in January, hundreds if not thousands of blogs will have been written on how you can use Facebook Groups in tandem with Pages to grow your organic reach. But if we again consider the pitiful reach of Pages, perhaps it’s worth allocating all of your energy on the platform towards Groups instead of Pages. This could be a particularly effective tactic if your business or client has a ready-made community of people looking for a place to discuss your product or industry. 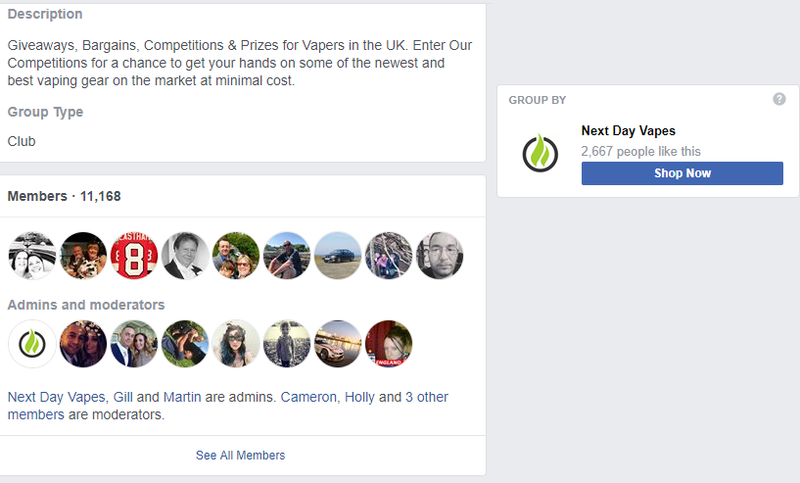 For instance, I used to work with an e-cigarette shop back in the UK, and as part of my recommendations for them I created a Facebook discussion group for the local vaping community to discuss, buy and sell items. There wasn’t another Group like it that served the local area, yet other parts of the country had ones already up and running with 2,000+ members. We saw rapid membership growth after it was set-up and it is now the leading group in the region. There are many benefits to be had from running a thriving Facebook Group. Your company’s posts can be pinned to the top of the discussion, they will be highlighted by default and you’re able to customize the group with your brand logo and color scheme. Yet let’s think of it in more basic terms. I probably check at least one Group every time I’m on Facebook, whether it’s a music sharing site or a football discussion page. And if they are created and managed by a company, their brand name is going to be in my consciousness on a daily basis – whether I realize it or not. The primary focus of the Group is still as a forum or marketplace, but you’re also getting additional exposure with minimal effort. Just check out this vaping group, where there are 5x more members than Page likes! The final option is to ditch Facebook altogether – just like Drunken Werewolf has. This depends on your audience size, engagement rates and overall business objectives, so it shouldn’t be a decision that is taken lightly. But if you’re sending more traffic to your website through Twitter, seeing more engagement on Instagram and driving more sales via Pinterest then why would you stay on Facebook? Only for the biggest companies that I work with do the ‘Likes’ graph go up at a steady rate. The reality for most small companies without significant investment is an extremely slow rate of growth where it could take years to build up a following on Facebook that is going to affect your bottom line. A lot of opinion pieces are putting forward a whole host of different ways to avoid, get around or dodge these drops in organic reach. But it’s only going in one direction, and all of this time you’re putting towards marginally growing your reach would be much better spent investigating proper marketing alternatives instead of workarounds and tricks. So here’s the question: are you considering ditching your Facebook Page altogether? Nick Harland is a freelance social media manager based in Barcelona who helps businesses all over the world achieve their social media goals - no matter the industry or size of the company. Why not find out more about Nick and connect with him on LinkedIn?